The ICT (Information and Communication Technology) Essentials Suite is an innovative program of instruction designed for delivery in various modalities. ICT Essentials is unique in that it works well for middle grades, high schools, higher education, and self-study. The courses focus on key skill sets within a given area of technology and through the use of Online demonstrations, digital activities and assessments, coupled with external links to deepen knowledge provide a complete learning environment and experience. 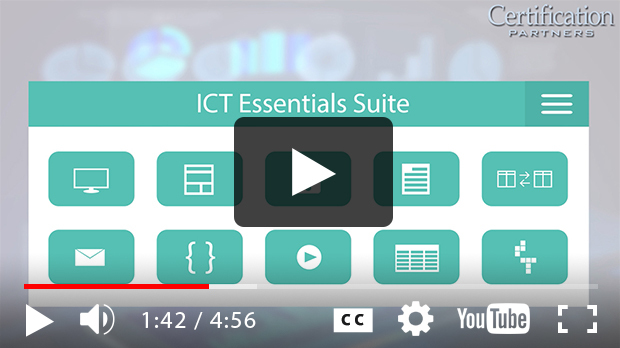 The 10 ICT Essentials courses span digital technologies associated with web development, multimedia, word processing, spreadsheet, database, Internet communications, cyber security, gaming, and computer programming. ICT is intended to raise digital technology literacy in all of the above mentioned arenas and will prepare students of all ages with the skills needed to meet the challenges of an increasingly technical world and opening doors of opportunity for pursuing a wide range of IT-related industry certifications and careers. Each course can be delivered as a standalone unit of instruction or via interdisciplinary integration. Each course features multiple activities to engage all learners across different learning styles. Built-in lesson quizzes and formative exams aid in preparation for the final summative certificate exam. Learners gain proficiency in a number of technologies and each course can be easily combined with others to give a well-rounded background in technology. Courses are designed around open source software, eliminating the need for purchasing expensive software. Each course provides links to prescreened resources that are available at no-cost or very low cost. ICT Essentials is a great first step to CIW certifications and success in the IT industry.